You could get this area with two different methods that involve area functions. First, you could determine the area function for this parabola that begins sweeping out area at x = 2, and then compute that area function’s output when x = 3. 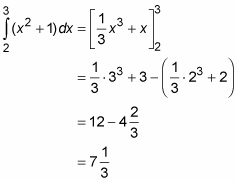 Second, you could determine the area function for the parabola that begins sweeping out area at x = 0, and then use that area function to subtract the area from 0 to 2 from the area from 0 to 3.
or any other area function. You just find any antiderivative, F(x), of your function, and do the subtraction, F(b) – F(a). The simplest antiderivative to use is the one where C = 0. So, here’s how you use the theorem to find the area under the parabola from 2 to 3.